First up, best photo ever used in an ad trying to sell something! Secondly, let me see if I have this straight. This rust bucket will cost me $200, unless I choose to risk my life and try starting this car which has not been started in five years, and for risking my life I have to pay an extra $300? WTF? If I try it and it does not work, is that still an extra $300? What if I buy it for $200, take it away on a trailer, and try it without you knowing, will you hunt me down for the extra $300? Just did my daily blog rounds.. It might be worth the price if its secrets came, too. 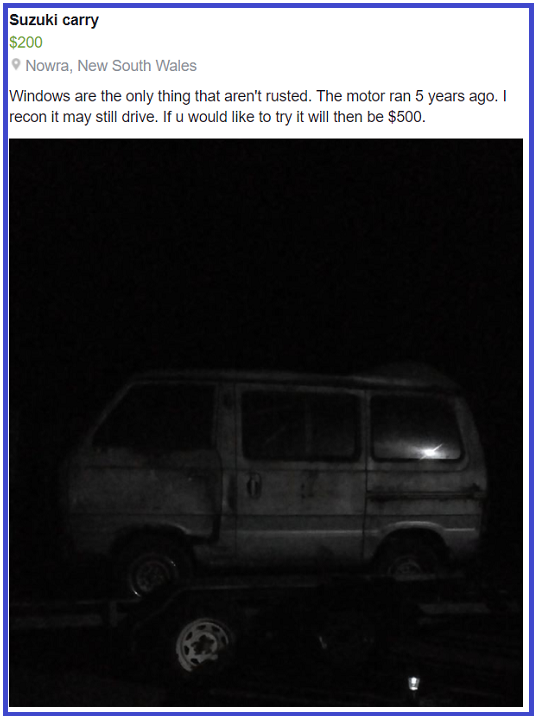 I agree the price is a bit shifty, I’d be bargaining to a midway price if I was interested and knew the engine would run. I wonder if you’d get more than $200 down at the scrap yard? Could be a deal there! !